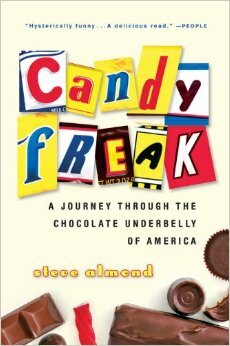 As someone who loves Candy, I was excited to read Steve Almond’s book about his journey to the chocolate underbelly of America. While I love chocolate and candy, I do not think that anyone is as much of a self proclaimed freak as Steve Almond. In this book that is part autobiography, part inside look at the small-scale candy industry, Almond takes the reader on a journey to the lesser known candy factories throughout the United States, a part of American culture which is often forgotten. Almond tours factory after factory sampling regional candy bars such as the Clark Bar, the Caravelle, Haviland Thin Mints, the Twin Bing, Valomilks and the Idaho Spud to name a few, detailing each the history, manufacturing process, and taste of each bar for the reader. I liked this book, but found that Almond was sometimes trying too hard to engage with the reader with his self-deprecating view of himself. I also often found myself bitter and jealous anytime Almond mentioned the cases of free candy he received after all his visits. One thing I did find interesting however is how the industry favours the big companies so much. This should not come as a surprise, but often time these smaller companies cannot pay the shelf fee to have a presence in grocery stores or national chains like wal-mart and thus are resigned to producing chocolate bars for regional/local consumers. If you’ve ever looked at the knock-off chocolate bars next to the cash register at Dollerama, chances are they were produced by one of these factories. It’s and interesting book and definitely a must read for anyone interested in the industry, or obsessed with candy in general. This entry was posted in Reviews and tagged 1950s, Autobiography, Candy, Candy Factory, Candy Making, Candyfreak, Chocolate, Local Candy, Memoir, Nostalgia, Present Day, Regional Candy, Steve Almond, United States on August 16, 2015 by kwils3.